I had hopes this restaurant would serve decent food. It had gotten fair reviews in the past. They advertise being focused on sustainable-organic agriculture from local farmers, with meat and poultry being organic or antibiotic and hormone free. The service at least, met that expectation; but the food fell far short. Pity. This place has all the elements – nice, large space; plenty of wines to choose from and a genuine French Bistro vibe going. With a name like Flavor don’t you think the chef should take extra care to turn out food that has some? Our meal should have been child’s play. Steamed Mussels with garlic, white wine and aromatic spices with grilled herb bread and a Flat Iron Steak Sandwich with roasted tomato-mayo, grilled red onions and mushrooms. The mussels themselves were fine, the broth was mediocre. Nothing stood out. But the flat iron steak sandwich though tender had absolutely no flavor. Served on what looked like a Pita pocket that was dry and unappealing. Did I mention they make their own bread, daily? Desert was the highlight of this lunch time meal. 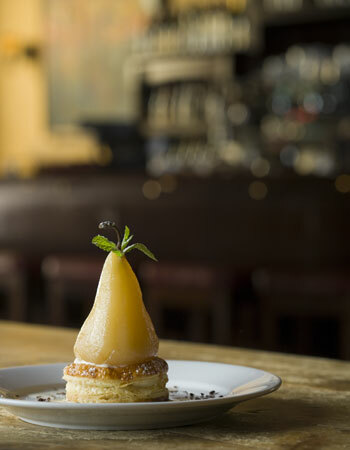 A Chardonnay Pear atop puff pastry with Mascarpone cream filling. Presentation was lovely and this signature desert was very good. One other point. This place is over-priced for the food it is turning out. And, with a Burger Favorites menu (8 different offerings) from $13.95 – $15.95 the verdict is in. Organic, antibiotic and hormone free sure is expensive!